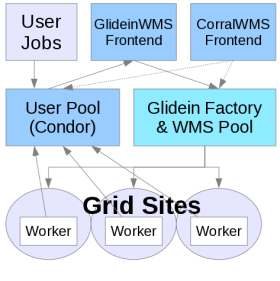 These examples assumes you have GlideinWMS installation running and as a user, you have access to submit jobs. Make sure you have sourced the correct HTCondor installation. NOTE: It is recommended that you always provide a VOMS proxy in the user job submission. This will allow you to run on a site whether or not gLExec is enabled. A proxy may also be required for other reasons, such as the job staging data. and you can see that no glideins are connected to your local pool. The GlideinWMS system will submit glideins on your behalf when they are needed. Some information may need to be specified in order for you get glideins that can run your jobs. Depending on your VO Frontend configuration, you may also have to specify additional requirements. The first number is the approximation of pi. The second number is how far from the real pi it is. If you repeat this, you will see how the result changes every time. Once the jobs have finished, you can view the output in the job.$(Cluster).$(Process).out files. While your jobs can run everywhere, you may still want to know where they actually ran; possibly because you want to know who to thank for the CPUs you were consuming, or to debug problems you had with your program. These additional attributes in the job are used by the VO Frontend to find sites that match these requirements. HTCondor also uses them to match your jobs to the right glideins. If you need help debugging issues with running jobs, see our Frontend troubleshooting guide.